Over the course of three evenings “Open Minds: Adapting to the Future”, a Toronto talks series organized by the Goethe-Institut, has brought together activists, futurists and artists to discuss digital future designs. Here, one of the speakers, Gesche Joost, talks about the turning point we are at digitally. Originally published in Canadian Art. Mrs. Joost , I feel skeptical most of the time that art and design can do very much about the huge problems that loom in our present and in our future. What are you working on right now that might suggest otherwise? I’m a designer, and I’m work very much with what is called design fiction. Design fiction is based on the idea that what design can do is not just, you know, create beautiful objects – it can invent possible futures through objects. So it’s something in between science and politics; it’s something in between technology and people. With design fiction, we don’t have to just deal with arguments about the future – we can put some evidence in front of our eyes. Foto: Marko Kovacevic © Goethe-Institut e.V. Can you given an example? Yes. For example, there is a huge debate in Europe currently around how we relate to robots. There is a lot of concern they will take away jobs, a lot of fear. And there is still a lot of fear about cyborgs, and arguments about humans as cyborgs. One artist-designer, Neil Harbisson, cannot see colours; he is colour-blind. Then he got a head-mounted antenna that will convert the colour he is facing into a tone or audio signal. He hears the colours. Harbisson wanted to wear the antenna in his passport photo, and initially it was rejected. But he insisted that the antenna should be considered part of his body because he had become a cyborg. Eventually, the antenna was included. These type of objects – like Harbisson’s specially designed antenna – make it much more concrete to talk about the relationship between robotics and the body. The argument becomes based on something you can touch, on visual evidence. You advise policymakers in the EU about digital design and related issues. Can you tell me a bit more about that? As a professor at the University of the Arts, I run a research lab, and I do all my political advice for the European Commission based on this research. One thing I do when I talk to politicians about digitization is bring some of the objects we are working on in the lab. Because, as I mentioned before, ideas about technology can get very abstract otherwise. So one example of this is when we are talking about data protection, privacy and e-health, I bring in a wearable computer we created in our lab – a beautiful jacket with an emergency alarm system inside. The jacket has a microcontroller which is open-source, and it is connected to your smartphone. So if you are an elderly person living alone, and you have an emergency situation, you just have to trigger a textile button, and then it sends your GPS localization data, and it calls a family member. This jacket is an example of an object for an inclusive digital society – something that is usable and intuitive in interface, and something that is beautiful, not stigmatizing, but with data kept on your smartphone so that it is up to you what to do with the data. Gesche Joost during her talk about “Design as an Early Warning System” in Toronto | Photo: Marko Kovacevic What do you think citizens can do to help make a better future through these kinds of projects? Well, community engagement is very important. So my vision of creating any kind of new tech is based on users and their insights and their everyday life experience. Citizen science is a big topic for us, or participatory design. For example, we are creating a so-called “living lab” in a local neighbourhood. The aim is to engage with community members and get their ideas on how they want to shape this community. One of the things we are working on in this community is called a Hybrid Letterbox. It was created because many elderly citizens said, “We don’t have a computer, so how are we to relate to all this digital stuff? Or provide feedback on our community?” But they knew how to use postcards. So we created a little box, and people can put in postcards saying what do they want to change in the neighbourhood – it can be writing, or a drawing – and we take a picture of this postcard and put it online on a blog so that everyone can see this feedback. It’s a very low-key interaction, and a low-key technology, but to me this is the starting point for being engaged in community, and for being a citizen. 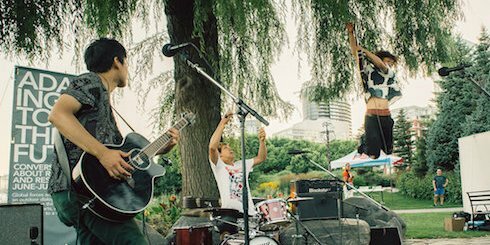 Toronto-based Japanese rock band Muniz0, whose music touches on relationships amid social fragmentation | Photo: Marko Kovacevic © Goethe-Institut e.V. 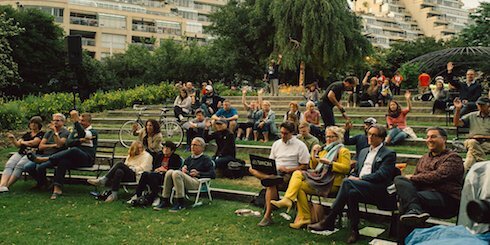 The “Open Minds” talks series in Toronto is being held outdoors. And this reminds me that one thing I worry about in regards to digital is that I over-engage with digital, as opposed to the natural. Is there a crisis, do you think, in regards to an over-engagement with the digital right now? I think there is a crisis. I think what we are now starting to do is draw our own borders and boundaries around digital use. And I think that’s the right decision. In Germany, there are some companies that try to make an artificial boundary. For example, at 5 o’clock in the afternoon, they switch down their main server. And that’s ridiculous, I’m sorry, because lots of people with young families might have to leave work early and they want to continue working in the evening, and that’s fine. 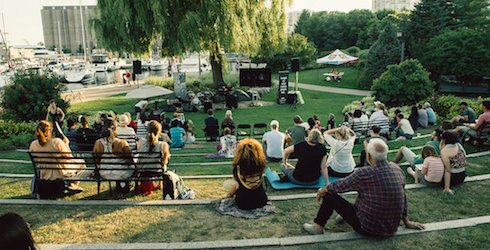 The “Toronto Music Garden” at Lake Ontario | Photo: Marko Kovacevic Some individuals are also starting to draw the line. For example, my PhD candidates, if they are writing, then they do email fasting and Facebook fasting: They check once in the morning and once in the evening, and that’s it. They make this digital detox of it. All of this drawing of boundaries is just starting. I think we should have more debate on that; I think there should be a sensus communis and a code of contact. But that is evolving. All in all, we should work on having a kind of common understanding on many digital things. Not understandings based on top-down decisions, but a common understanding. The interview was conducted by Leah Sandals, Managing Online Editor at Canadian Art. The original interview was published at 12th July 2016 and has been edited and condensed.